The Spectre 9932 fits some Dodge Ram 1500, and Dodge Ram 2500 models. See vehicle applications for details. Spectre air intake systems are designed to get more horsepower and torque from your vehicle while working to protect your engine from harmful debris. 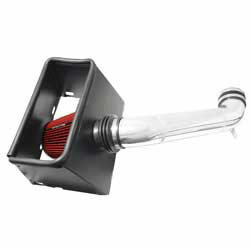 This air intake comes with a red Spectre reusable low restriction air filter, high quality polished aluminum tubing and a black powder coated heat shield (where applicable) to help prevent engine air from entering the intake inlet. Spectre air intakes come with the necessary boots, clamps and hardware for an OE fit and finish. Very easy install If you have the least bit of mechanical ability it will be a breeze. Sounds great when you punch it. Definitely feels stronger on take off. Probably better fuel mileage too, but I've only had it installed 2 weeks. Looks amazing installed as well. I am very pleased to say I am very satisfied with what you guys have placed on the market. The instructions are very easy to read and understand. Once I installed it, I did notice a deep sound when I step on the throttle. I love it. I would recommend this product to anyone. Great job Spectre. I am very happy with my product. It has an awesome sound difference and I can definitely tell a horsepower difference. Don't know about the gas mileage yet but im sure it will help out. Would recommend this to friends and family for sure.